Well folks, it’s finally official – after months of rumors and leaks, Spyro Reignited Trilogy has been announced by Activision. Following the success of Crash Bandicoot N. Sane Trilogy, speculation almost immediately began to swirl that Spyro was also set to make a fiery comeback. In February Kotaku reported a Spyro Trilogy remaster was in the works, and since then, excited fans have busied themselves digging up new evidence of Spyro’s return and getting excited over false alarms. The most recent leak happened this very morning, with Amazon Mexico accidentally letting Spyro Reignited Trilogy out of the bag early. So yes, it’s been a long ride, but we now know Spyro Reignited Trilogy is the real deal (try to act surprised). You can check out the game’s debut trailer, below. Spyro Reignited Trilogy introduces players to a fully remastered game collection of the three original Spyro games that started the phenomenon — Spyro the Dragon, Spyro 2: Ripto’s Rage and Spyro: Year of the Dragon. The Spyro Reignited Trilogy features the fun and nostalgic gameplay that fans remember with more than 100 levels, enhanced reward sequences, Spyro’s gang of zany dragons and other goofballs (including Sparx the Dragonfly, Hunter, Sheila, Agent 9 and Sgt. Byrd) and more. The trilogy also includes improved environments, updated controls, brand-new lighting and recreated cinematics for added flavor in this one-of-a-kind adventure. Each level in Spyro Reignited Trilogy is mapped faithfully from the originals. 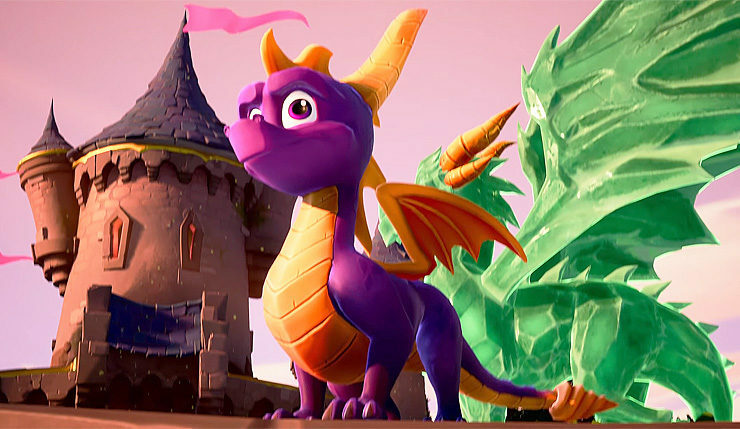 The characters are creatively re-imagined with additional flair allowing fans to rekindle the fire with Spyro and his crew like never-before. Players will experience a trilogy that’s loaded with an astonishing amount of detail, refreshed modern day mechanics, full analog stick support and smooth camera handling. Spyro Reignited Trilogy also re-imagines Stewart Copeland’s original soundtrack from the first three games. Interestingly, Spyro Reignited Trilogy won’t be made by Crash Bandicoot N. Sane Trilogy developer Vicarious Visions. Instead, it will be developed by Toys for Bob (the team behind the recent Skylanders games) using Unreal Engine 4. It will be interesting to see how Spyro Reignited shapes up given these behind-the-scenes changes. Spyro Reignited Trilogy is set to glide onto PS4 and Xbox One (yup, no timed exclusivity this time) on September 21. Update: While not officially confirmed, it looks like Spyro Reignited Trilogy is also coming to Switch, as the game was briefly listed on Nintendo’s website.